Each year around this time, Aero Corporation assists the University of Michigan’s Conference Series by handling study materials for their seminars, held throughout the state, on the latest tax preparation rules and methods. We assemble the contents, shrink-wrap the packages, and distribute them to seminar locations. 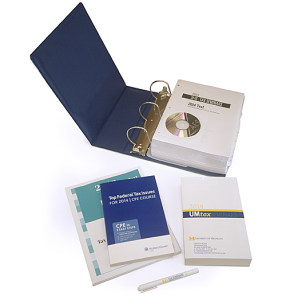 The study set’s centerpieces are books on federal and State of Michigan tax regulations. Seminars run from late October through mid-December, in advance of the coming tax preparation season. © 2019 Aero Corporation. All rights reserved.